Elected prosecuting attorneys are connected to powerful members of the State Bar, judges and other government officials. Hauge is also is a former president of the Washington Association of Prosecuting Attorneys. While most judges generally won’t side against Carter – evidenced by the 15 judicial decisions in his favor because the charges are so ridiculous – they are hesitant to question or discipline one of their own. It all appears to stem from an incident that happened at KRRC back in 1999. Hauge originally was a guest instructor on the law for the personal protection classes. At the same time, he was involved in a high-profile prosecution of a man who used a gun in self-defense. After the jury unanimously found the man innocent, Hauge insisted on taking up two classes lecturing the club’s firearms students about the case. Marcus knew the students weren’t hearing the full story, and after Hauge left the second day, Marcus came in and played defense attorney, presenting the other side. When he finished, he asked the class if they would have found the gun owner innocent, and every single member of the class raised their hand. He also advised the students that is why folks need to know whom they are voting for. This apparently didn’t sit well with Hauge, because ever since this incident, Hauge has tried relentlessly to prosecute Marcus, accusing him of modifying a weapon to make it fully automatic, attempting to get the range shut down by suing the range and naming his wife, Sharon as a defendant – making it personal by dragging her into it. Hauge also signed many of the pleadings himself, which is odd for an elected prosecutor; usually their deputies sign everything. Incidentally, the chief investigator who accused Marcus of illegally modifying a rifle into a fully automatic weapon, Bruce Jackson, was caught two years later drunk driving and soliciting a prostitute (who was really a police officer) while driving a government vehicle. Marcus has not been represented by an attorney, even though it’s meant countless trips to court. Hauge tried to shuffle the case off to King County after being accused of bias and conflict of interest, but prosecutors there refused to prosecute Marcus, realizing the case was so poor. Unlike Hauge, who has refused to talk to Marcus for almost 13 years, and will only talk to an attorney, the King County prosecutor talked to Marcus immediately, and after hearing Marcus’ side, placed it right back into Hauge’s lap. Astonishingly, Hauge resumed the prosecution after the King County prosecutors dropped the case. One Kitsap County deputy prosecutor under Hauge privately admitted to Marcus that if it had been up to him, he would have had a judge dismiss the case a long time ago. Meanwhile, Hauge appears to have joined forces with the Department of Community Development to try and get the range shut down. The County wants to seize the land for a proposed 1,000-acre park. They filed a civil nuisance lawsuit against KRRC and Marcus’ wife, Sharon, in 2010 which is still ongoing. Initially in 1993, the County agreed to grandfather the range into new zoning restrictions, but now the County is trying to thwart that exception. First they claimed the range was too noisy. When that didn’t work, they said lead from the bullets on the ground was an environmental hazard and needed to be removed. Since virtually all the outdoor gun ranges in Washington permit lead bullets, this is just more evidence that Marcus’s range was targeted. KRRC complies with all EPA regulations regarding lead; in fact, the range goes beyond the requirements. KRRC has an environmental stewardship committee, headed by a retired environmental engineer. The EPA came out and tested the land and found no problems with it; at any point near the property, one could build a children’s playground. The County next tried to claim the range was polluting wetlands, but that went nowhere; even the Army Corps of Engineers was irritated that they were required to come out and look at nothing. The County is also trying to get rid of the range by drastically increasing the rent. First the rent was increased from $3,000 per month to $7,000. Now, the County is trying to increase the rent to $28,000, the “full use rate” for a gun range, which is not accurate. No other properties or ranges are being held to these standards. Camp Wesley Harris, the adjacent naval reserve, has never had lead cleaned up from its property. The reality is, lead is not a huge problem for the environment. It is copper, not lead, that is not good for salmon once it gets into the water. Having no success at taking on Marcus and KRRC with these initial attempts, the County started discussions to destroy KRRC’s grandfathered status. They proposed that grandfathered ranges would have to additionally qualify for a new “operational permit.” This permit would cost thousands of dollars in order to generate the required engineered designs. Ranges would be limited to only .308 ammo, and require overhead baffles; blue sky ranges would be prohibited. The noise would be limited to 86 decibels – not even possible considering a mere piano is 50 decibels. The hours open would be drastically cut back. KRRC tried to come to a settlement with the County, offering to cut its hours by 1,000 per year and prohibit certain types of firearms. The County refused to budge. Marcus continues to defeat Hauge at every step The battle has consumed hours of his life that he will never get back. Most people would have buckled under the pressure, either taken a plea agreement or a loan to pay for an attorney. Not Marcus, who is smarter and harder working than Hauge realizes. Neighboring Pierce County commissioners (Tacoma) were so appalled by what has happened to Marcus, that they passed an ordinance stating that ranges can’t be sued for being a nuisance. Some of the government officials who are forced to come out to inspect KRRC are apologetic to Marcus, realizing they are being sent there solely to harass him. The NRA is stepping in and filing an amicus curiae on behalf of the range. The NRA generally does not get involved in cases unless there is a reasonable chance of winning, so hopefully this longstanding political vendetta will finally get some exposure. The amount of taxpayers’ money that has been spent on is in the millions. The financial and emotional stress it has caused to Marcus and KRRC is unquantifiable. Marcus has started a petition at the KRRC website to tell the County to stop prosecuting KRRC and adopt the Pierce County ordinance, which can be signed at gunsafety.org. The Kitsap County Commissioners can be contacted here, prosecutor Russ Hauge here, and Community Development here (Larry Keaton, Steve Mount, and Jeffrey Roe). Don’t let this continue any longer, Marcus has been harassed long enough. 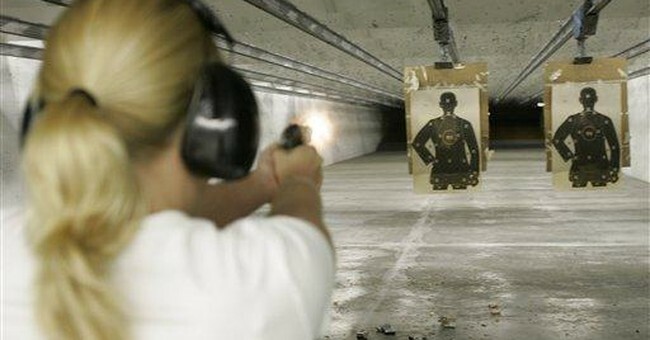 If gun control zealots are permitted to harass one gun range this much, other ranges will be next, in this ongoing assault against the Second Amendment.